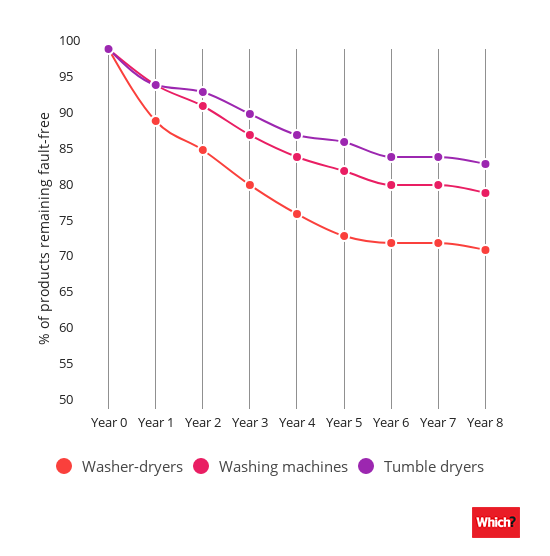 How reliable are washer-dryers compared to washing machines and tumble dryers? Washer-dryers are one of the worst appliances for reliability. Only cookers are worse, Which? research has found. This means washer-dryers are less reliable than both washing machines and tumble dryers – worth bearing in mind if you’re shopping in the sales. Discover the top washer-dryer brands. Owners of washer-dryers have told us they expect their machines to stay fault free for at least nine years. However, our survey of more than 700 washer-dryer owners found that more than a quarter of them had developed a fault by eight years. Just 81% washer-dryers remain fault free after three years, compared to 92% of washing machines and 94% of tumble dryers. After five years just 74% of washer-dryers are still without a fault, compared to 83% of washing machines and 87% of tumble dryers. How reliable are the big brands? We’ve researched reliability of all the top washer-dryer brands, including AEG, Bosch and Zanussi and found substantial differences in how reliable they proved to be. One third of machines from the least reliable washer-dryer brand were reported as faulty after eight years, compared to just one fifth of machines from the brand that topped our reliability ratings. Will paying more get me a better washer-dryer? Our research shows paying more for a washer-dryer doesn’t necessarily mean you’ll get a more reliable machine. In fact, the brand with the lowest average spend achieved a decent 70% reliability rating. 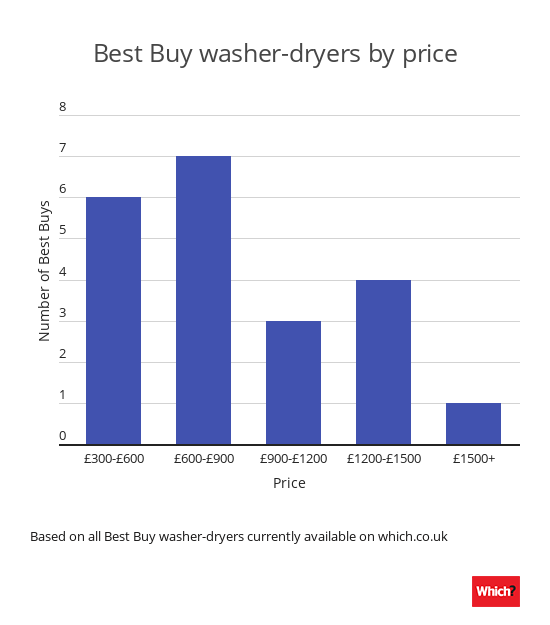 We currently have more than 80 washer-dryers reviews and, while there are plenty costing more than £1,000, just last month we uncovered a Best Buy washer dryer for less than £400. We don’t award Best Buys to brands with a low reliability rating. What are the most common washer-dryer faults? One in ten of those who reported a problem with their washer-dryer said their machine failed to dry properly, making it the most common fault experienced overall. While some common issues such as a blocked filter or a noisy machine can be straightforward to deal with, or won’t have much effect on machine performance, other problems such as an electrical failure will need to be fixed by an expert. Alarmingly, more than a quarter of faults reported by owners of washer-dryers were classed as catastrophic, the most severe category of fault. Catastrophic faults leave the washer-dryer unusable and repairs are needed before it can be used again.